One of the things I have been doing this month is working with 10th graders in one of our Mid-Pacific eXploratory (MPX) Humanities classes. Students have been building research outlines for debates on U.S. History oriented topics. The US should allow undocumented immigrants currently in the U.S. a pathway to citizenship. The US should consider implementing a single-payer health care system for all. The #Metoo movement has done more good than harm. Sit-lie bans should be repealed. The U.S. should have stricter gun control laws. 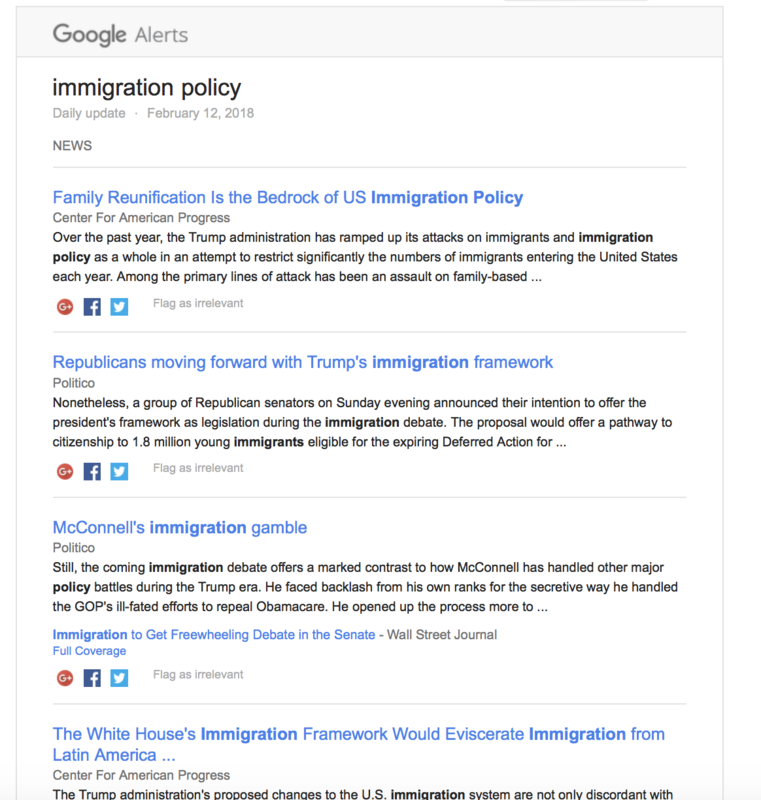 Given the the currency of most of the topics in Congress at the moment, it seemed like a nice opportunity to introduce students to Google Alerts. Enter your initial search query. Once you have an initial search query, you will see an Alert preview at the bottom of the page. Check this preview to be sure that you are getting helpful results. If your preview results look good, you can go into your Alert options to set the Alert parameters. 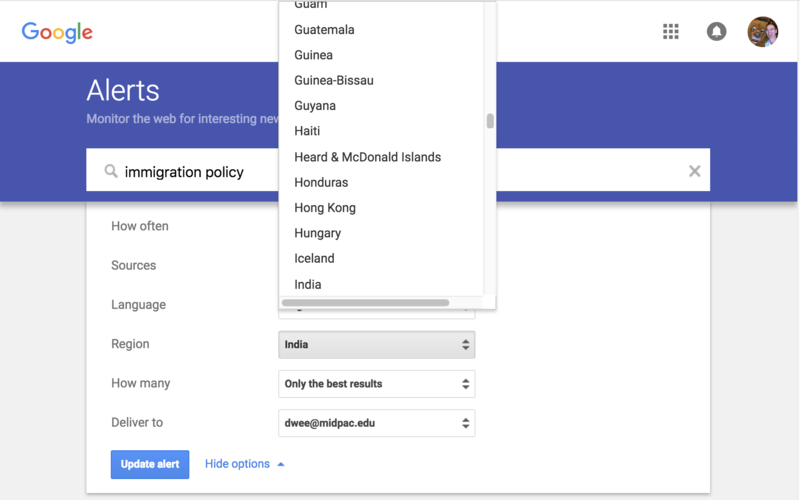 A nice option for students doing research on global topics is to set the region for a non-North American region. Alerts are delivered to your email inbox like this. The links take you out to the original article. As is my wont, when I was thinking about introducing Alerts to my kids for the first time, I sent a query out to the list and received these very helpful tips. I do teach some students to set up alerts. Make sure they look at/think abut all the options. Depending on the length of the project, I like to have them go back in about 2 weeks after setting them up and tweak their search. Honestly, they can feel aggravated by what they get, and should be empowered to change it, rather than ignore it. Wonder if you could have them print and annotate the search results from the first several results they receive to decide how to tweak. Or, run the search they are putting in the alert and annotate those results? Something to make it a more thoughtful process, set up for success. My main thing is that I encourage kids to be very deliberate with their alert query (eg. use a search string that has already had success) so that they’re not inundated with irrelevant stuff! 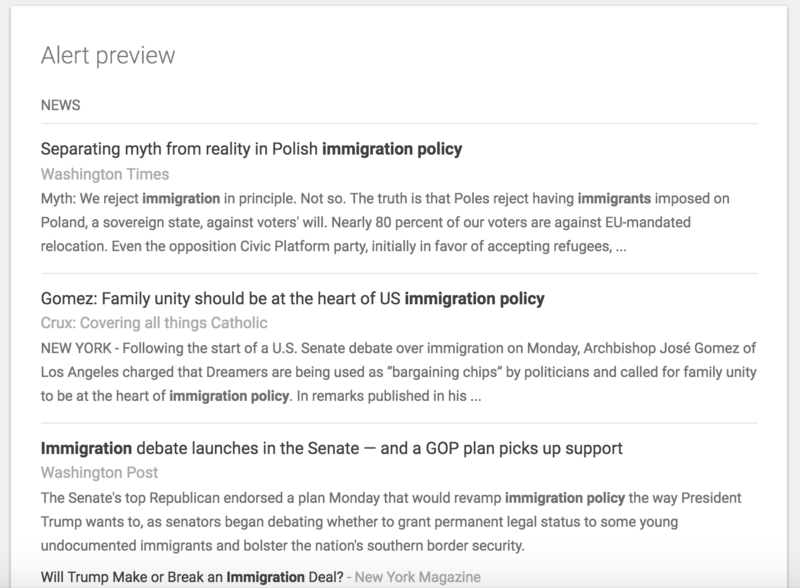 I teach Google Alerts for a similar research / debate project with juniors and just have to remind them to set the alerts once a day instead of “as-it-happens” to keep their inbox more manageable and to set the sources to “news” instead of automatic. But I think the big thing, while it seems simple, is just reminding / showing them how to turn the alerts off after the project is done. 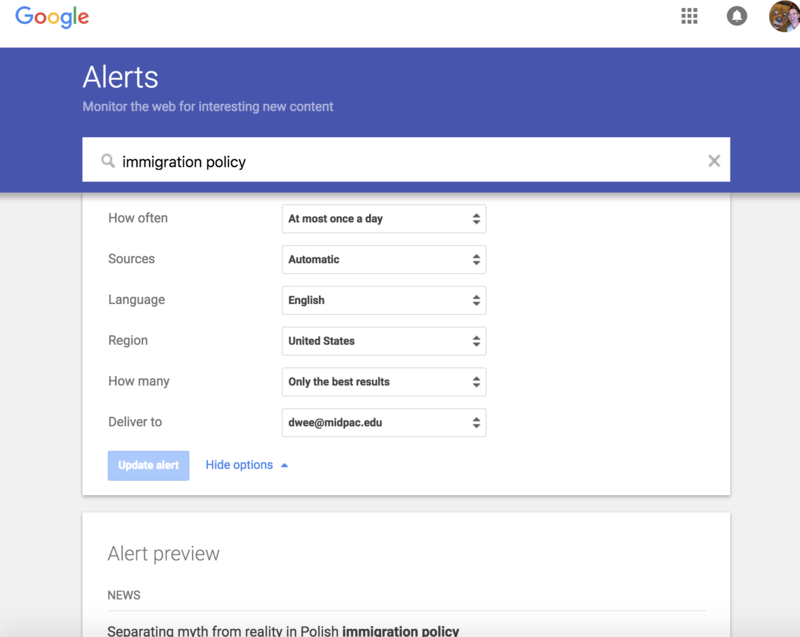 If you haven’t thought about Google Alerts, give them a try. I’m considering suggesting that we have students set up an Alert for their names and user names as part of our work in the digital citizenship arena. If they’re new to you, how might you use them? I’d love to hear your thoughts and ideas! 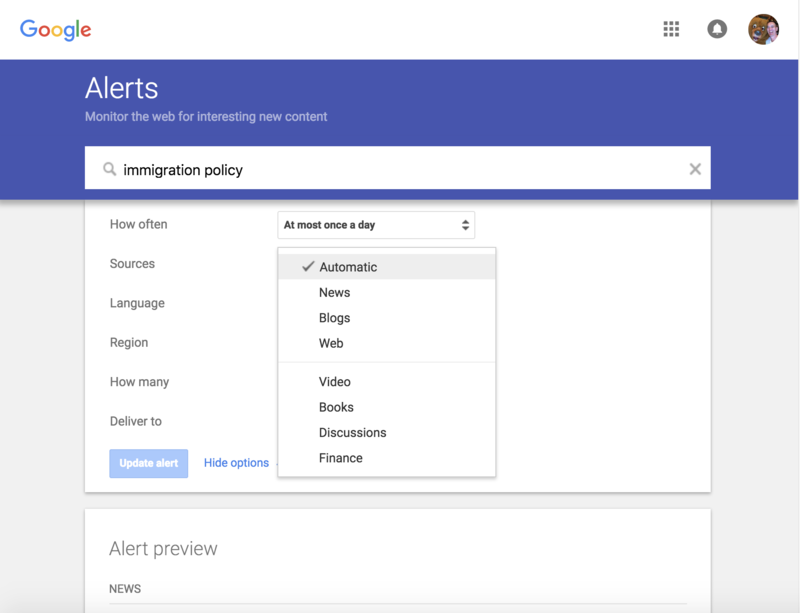 Thanks for this great post–I haven’t introduced our kids to Alerts, but I will be in the next couple of days as I work with the 9th grade on researching for their Oration project. Love new tools! Dave, what is the super-fab screen capture or snipping tool you’re using? Does it include the space for comments and directions at the bottom, or did you add that?